The Baghdad Pavilion (or Baghdad Kiosk) was built to commemorate the Baghdad Campaign of Sultan Murad IV after 1638. With its tiles dating to the 17th century, mother-of-pearl, tortoise-shell decorated cupboard and window panels, this pavilion is one of the last examples of the classical palace architecture. From the mid-18th century onwards, the building was used as the Library of the Privy Chamber. 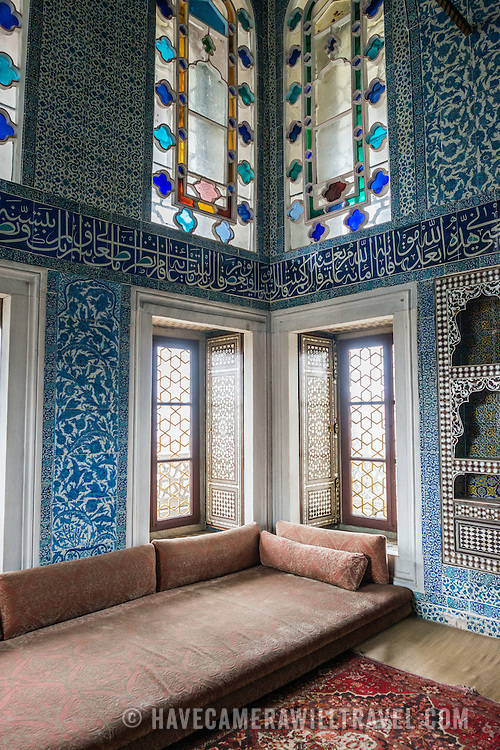 On a peninsula overlooking both the Bosphorus Strait and the Golden Horn, Topkapi Palace was the primary residence of the Ottoman sultans for approximately 400 years (1465–1856) of their 624-year reign over Constantinople and the Ottoman Empire. Today it is one of Istanbul's primary tourist attractions.